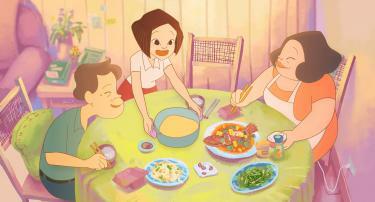 Chi, second from left, makes dinner for her parents in On Happiness Road. Before even mentioning the well-crafted, tear-jerking story and the whimsical, colorful animations, the most impressive part of On Happiness Road (幸福路上) is how it manages to condense four decades of Taiwanese politics, economics, traditional and pop culture as well as everyday life into 109 minutes without mucking up the narrative. Of course, the viewer probably needs to have grown up in Taiwan or have a decent understanding of its turbulent recent history to catch all the minute details, but even so, it’s a pretty solid drama following the past and present of a Chi (Gwei Lun-mei, 桂綸鎂), a Taiwanese woman in her 30s who returns home to Happiness Road from the US following the death of her grandmother. There’s so much to explore here, including parental expectations, childhood dreams, fear of having children and the pursuit of happiness. Again, some themes will speak louder to 30- and 40-somethings who went through Taiwan’s education system, but they are still universal enough for foreign audiences. Somehow, all of this nicely fits into one movie — although the resulting emotional rollercoaster does leave the audience a bit exhausted at the end. It is an impressive debut from Sung Hsin-ying (宋欣穎), who started making this film after winning the NT$1 million top prize for the Golden Horse Film Project Promotion in 2013. Born on April 5, 1975, the day former president Chiang Kai-shek (蔣介石) died, Chi experienced the entire transition from martial law and autocratic rule to democracy. Her early experiences encapsulate the era perfectly, from being forced to speak Mandarin in school, to her father being addicted to buying Patriotic Lottery (愛國獎卷) tickets. Chiang was still hailed as a “great man” back then, and Chi wanted to follow his example as a child. The references are very detailed, down to using the old translation for Disneyland (迪士奈, dishinai) instead of the current dishini (迪士尼). Chi’s friends represent a cross-section of Taiwanese society, from the mayor’s son to the daughter of a US serviceman who abandoned her mother to a child who moonlights as a “spirit medium” that predicts the Patriotic Lottery’s winning numbers. They all have different backgrounds, dreams and fates, but it’s all part of the Taiwanese experience. Almost no stone is left unturned, as Sung even gives Chi an Aboriginal grandmother to highlight the diversity of Taiwanese culture that was suppressed back then. Her personal experiences reflect the larger picture as she is bullied due to the controversial Wu Feng (吳鳳) story in the textbooks that painted Aborigines as bloodthirsty savages that were only “reformed” through Wu’s sacrifice. This story brought shame to many Aboriginal children and would be a focal point of the later Aboriginal rights movement. As society changes, Chi’s world view does too, especially when her older cousin is arrested and tortured for reading the banned book by historian and independence activist Su Beng (史明), Taiwan’s 400-Year History (台灣人四百年史). The entire story follows this vein, seamlessly incorporating the social and political changes in Taiwan as Chi’s life progresses into present day. Even her time in the US coincides with major events such as the 9/11 attacks, which can make things feel a bit systematic or formulaic, but it works for the most part as the audience knows what to expect, creating a sense of order of all the underlying elements between each sequence. The dialogue will be immediately relatable to most Taiwanese as Chi struggles to fulfill her parents’ expectations well into her 30s. But connecting the Taiwanese perspective to the world is the general theme of happiness, hence the film name. Chi has gone from a poor family who believes that having enough to eat equals happiness to achieving the American Dream, but she is still not happy. As she looks back at all the influences that shaped her life, things begin to make some sense. Even though rooted in reality, the animation is playful as we frequently visit Chi’s dreams, imaginations and fears. The captivating illustrations are the finishing touches to the excellent story and history lesson, adding a sense of the magical to the tale that might otherwise fall a bit on the gloomy side. Her dead grandmother also frequently appears to help her out at times, topping off the fantastical elements that make this film truly a gem.